In 1964, the Bolshoi Theater created a lot of commotion among theater critics by including the phantasmagoria opera "A Midsummer Night's Dream" by Benjamin Britten in its repertoire. 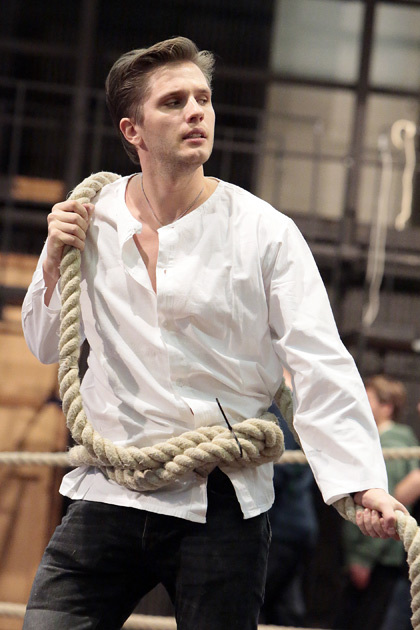 In November 2016, another opera by this mysterious Englishman made its premiere at the Bolshoi Theater - Billy Budd. The opera is based on Herman Melville's novel which was published posthumously in 1924. The opera was first staged in 1951 at the Royal Opera House, and in 2016 it finally made it to the main stage of Russia. Both the opera and the novel are dark and somber, exploring the inner workings of man, and exploring such concepts as jealousy and social behaviour. William Lacey, a British conductor, was invited to conduct the opera at the Bolshoi Theater. Like David Alden, this wasn't his first experience at the Bolshoi Theatre. The main protagonists of the Billy Budd opera are: Billy Budd, the new sailor, who is only starting to understand his new responsibilities; John Claggart, master-at-arms; and Edward Fairfax Vere, the captain. All three heroes have very different personalities, and these personalities are explored throughout the opera. Billy Budd quickly becomes very popular on the ship. It's no surprise since he is smart, strong, good-looking, and upbeat. Claggart quickly becomes envious, and tries to accuse Billy of conspiring to rebel and cause mutiny. In a private meeting, the two men meet, and upon hearing the accusation, Billy Budd, not able to respond with words, strikes Claggart on the forehead. The blow sends the accuser to the ground, and turns out to be fatal. Billy Budd's fate now hangs on the captain's decision. Edward Fairfax "Starry" Vere is a strong, honest, but fair captain. He understands that God punished Claggart through Billy's hands, but knows that he has to abide by the law. Vere judges Billy guilty and sentences Billy Budd to death. "God bless Captain Vere!" - the last words of Billy Budd. If you enjoy deep, philosophical novels, then we invite you to see this opera. You can buy tickets to the Billy Budd opera on our website. The opera is playing February 24, 26, 28 and on March 2nd. The opera is staged on the New Stage (Novaya Stsena). Ticket prices starting at 2000 rubles.